Since he moved to the NL in 2006, Bronson Arroyo has become well acquainted with the home run ball. Take any three-year period from 2006 through 2010 and you’ll see Arroyo’s name near the top. In fact, things have gotten worse — relatively — as time has passed. Looking at pitchers who threw 500 innings in a three-year span, Arroyo has gone from tenth (2006 to 2008) to fifth (2007 to 2009) to third (2008 to 2010) in HR/9. But he’s outdone himself this year: In 62.2 innings he has allowed 14 home runs — or a 2.01/9 IP rate. That’s the worst among qualified pitchers. The problem becomes deeper when we look at league-wide home-run rates. NL hitters have swatted a homer in 2.3% of all plate appearances. Pitchers have a HR/9 rate of 0.9. Here’s how they’ve fared in the other years Arroyo has been in the league. So despite the decrease in overall home-run rate, Arroyo is allowing more of them. To this point, he’s managed to keep his run suppression in check despite it, but the issue has come to a head in early 2011. His home park exacerbates the issue, but it’s not entirely at fault for Arroyo’s collapse this year. He’s second in the league with a 2.17 HR/9 at home, with one out of every 18 batters hitting one out of the park. On the road he’s a little better, but not much. One of every 24 batters has taken him deep — a 1.78 per nine rate and 11th worst in the league. This is probably to be expected, given GAB’s park factor. The most concerning aspect of Arroyo’s season is the bad luck trifecta he’s experiencing. That is, his BABIP, LOB%, and HR/FB are all worse than league average by a decent margin. That might be awful luck, but it also might be that he’s just not throwing quality pitches. While the axiom is that pitchers have little control over a ball once it’s in play, we all know that pitches thrown near the middle of the plate are going to get hit harder and farther than pitches on the edges. Given Arroyo’s inflated BABIP and home run rate, it’s entirely possible that command, and not luck, is the main culprit in his early season decline. While it is difficult to measure command, we can look to some indicators for possible red flags. One thing I noticed when examining Arroyo’s stats is his horrible performance when he’s ahead in the count. Here are his numbers after an 0-1 and after an 0-2 count, compared side-by-side with the NL average this year. It’s not as though he’s falling behind more often than in the past, either. Of the 282 batters he has faced this year, 33 have put the ball in play on the first pitch (11.7%), 103 have seen a 1-0 count (36.5%), and 146 have seen an 0-1 count (51.8%). Here are his percentages from 2006 through 2010. The difference is, of course, that this year it doesn’t matter whether he falls behind or gets ahead. Hitters are still smacking him around. He’s not working longer plate appearances, either. He’s averaged 3.62 pitches per PA this year, which is actually his lowest since coming to the Reds. Normally I’d think that’s a good thing, but given Arroyo’s results this year, I’m more inclined to think that it’s because hitters are finding better pitches earlier in counts. I’d love to dive into his PitchFX page and see if there are any anomalies, but take a look for yourself. The classification is all over the place, so I’m not sure we can read too much into it. Maybe someone with a corrected database can provide further insight on that issue, but I don’t think we can find any useful data there. 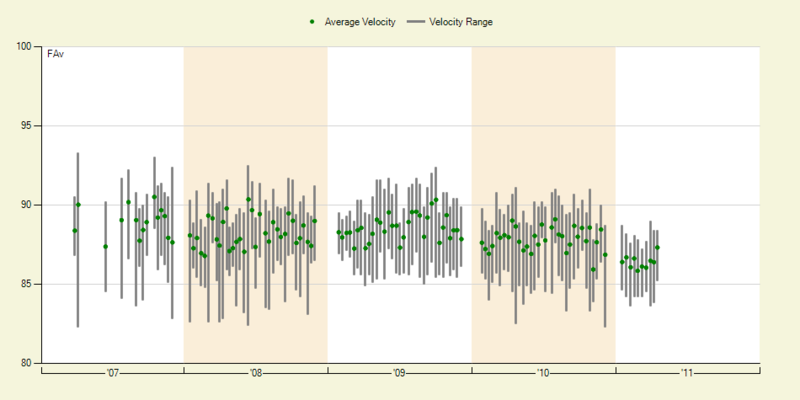 The classification issue does make fuzzy the issue of velocity charts. Yet there is a clear red flag here, where one does not exist in the pitch selection. Maybe hitters are just jumping on his fastball because it’s slower and more hittable. The pitch-type value of his fastball is currently -1.27 per 100 pitches, which represents the worst rate of his career. I’m not prepared to declare that a solid conclusion since there are some uncertainties in the data. But for everywhere we’ve looked for something wrong with Arroyo, this makes the most sense. Arroyo will get a shot to turn things around tonight when he faces the Dodgers. The start comes at home, which will make things a bit tougher. For all of his woes this season, the greatest one remains the long ball. He’s had problems with it before, but his other skills have kept the damage in check. This year, that’s not the case. If it really is lost velocity on his fastball, the Reds could be in for a Javier Vazquez 2010 type year. Which, considering the state of Cincinnati’s pitching, couldn’t come at a worse time. We hoped you liked reading Why the Long Ball, Bronson? by Joe Pawlikowski! It should be noted that Arroyo has been dealing with mononucleosis. Obviously it’s impossible to determine just how it has affected him, but it would not be a stretch to suggest that is the cause of his diminished velocity. And as a guy who has always been one who succeeded on deception, he would seem to be more prone to suffering when not on his game.